I was very excited to return to My Saddlebrook Farms (after almost a year later) for the second part of my riding lessons. I hadn’t seen my friends, Hudson and Charlie, in a while. Wish that the farm was much closer to the town I reside in; it’s up in Walden, New York =(. I chose a pretty busy weekend to go too; my coupon was about to expire. The farm was swamped with eager riders. I wouldn’t have minded to be paired off with Hudson again (who had just returned from a ride and earned some rest), but instead I got to ride a very nice steed (appaloosa? quarter horse, thoroughbred mix of 18 years of age) named Jupiter. I love that name! No vices and such a sweet natured school horse who responded to commands pretty well. My instructor was the very knowledgeable and good humored Dave. After some basic review and corrections to my riding form, I guess Dave thought I was ready to learn balancing and posting on a walking Jupiter, followed by a trotting Jupiter. Wow, that was pretty tough (I was sore for three days after the lesson)! I was a bit stiff too at the start of the lesson from some mild anxiety… All the while trying to remember heels down, toes up… It was all a lot of fun though! When I was able to correctly post, it felt effortless, weightless (like doing a correct Crow in yoga) because I followed the rules and allowed the movements to flow without the emotional blocks- just trusting myself and Jupiter. Dave assigned me some homework to help improve my posting techniques- a pillow and two wine glasses, think red wine and white carpet ;). Somehow Jupiter knew to stop when his trotting was getting too much for me; my pal was also pretty perceptive. Jupiter has quite the bouncy trot! As always, after the riding lesson, I treated Jupiter to an apple and carrots because he had worked very hard for me that day. 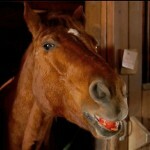 Normally I dislike carrots and am all too happy to share them with my equine friends. I also visited Hudson and Charlie after saying goodbye to Jupiter. I don’t know if Hudson remembered me at all, afterall, I rode him just once and it had been months ago but when his eyes met mine, he seemed to look at me with a familiarity of a colleague. I would love to believe that he did recognize me. Like I mentioned in a previous post, horses can have very expressive eyes sometimes. I have such a soft spot for these animals, most people would think I’m crazy… well, except for those people who love horses as much as I do; they would probably understand. I have included below, a still from a video my husband created for me to remember Charlie by. He is happily noshing on a Jazz apple. More photos to follow.